This place is more than perfect. I going back soon for sure. 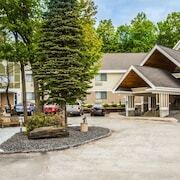 Where to find Montpelier hotels near an airport? Where can I find hotels in Montpelier that are near tourist attractions? For tourists planning a trip to Stowe and are after a basic or more upscale hotel or apartment in Montpelier, there is a small range of options. Within easy driving distance of central Montpelier you'll discover 7 Expedia-listed hotels from which to choose. The Capitol Plaza Hotel & Conference Center and The Inn at Montpelier are the most centrally located lodgings in Montpelier. Expedia's accommodation database has just a small selection of economical hotel options in Montpelier. 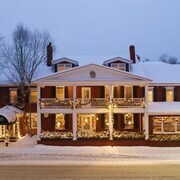 The Hilltop Inn of Vermont is one such listing. 30 kilometres (18 miles) away from the heart of Montpelier, is the Topnotch Resort. Alternatively, the Stowe Mountain Lodge - Destination Hotels & Resorts is positioned 35 kilometres (21 miles) away. Two more Expedia-registered hotels include the Mountainside Resort at Stowe and the Trapp Family Lodge. The broader Northern Vermont region is well worth seeing as well. Northern Vermont boasts forests and mountains. Commonly visited Northern Vermont visitor destinations include open-air markets. Tourists in this part of United States of America enjoy snowboarding, skiing and cross-country skiing. Barre is 11 kilometres (7 miles) to the southeast of Montpelier and is home to the Barre Opera House and Rock of Ages. If you'd like to visit Barre, check out the room rates at the Quality Inn and Hollow Inn and Motel. 25 kilometres (15 miles) to the north of Montpelier, you'll also find Stowe Village Historic District, which is home to the Stoweflake Mountain Resort & Spa and Green Mountain Inn. While visiting Stowe Village Historic District, set aside a little time to check out the Stowe Theatre Guild and Appalachian Trail. Just because you are traveling in Stowe, doesn't mean you can't indulge in your obsession for sports. You will find Thompson Arena 65 kilometres (41 miles) to the south of Montpelier. Those wanting to find a bed close to the action can take their choice from the Hanover Inn Dartmouth or the Six South St Hotel. If you are flying into or out of Burlington International Airport and choose to stay nearby try Sonesta ES Suites Burlington VT or Courtyard by Marriott Burlington Williston. What are the most popular Montpelier hotels? Are there hotels in other cities near Montpelier? 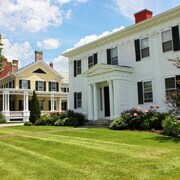 What other types of accommodations are available in Montpelier? 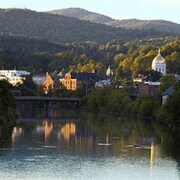 Explore Montpelier with Expedia.ca’s Travel Guides to find the best flights, cars, holiday packages and more!